The Brand NEW Fluval FX6's are now available! These filters are absolutely amazing. Top-of-the-line quality! The Fluval FX6 high performance canister filter pumps out 925 GPH and are suitable for aquariums up to 400 gallons. - The Fluval FX6 pump is on the bottom of the Fluval FX6 high performance canister filter, so there is NO need for Priming. - The The Fluval FX6 input and output connectors to and from the Fluval FX6 high performance canister filter are angled at 45 degrees for easy positioning. - The The Fluval FX6 output nozzle actually has two nozzles in one. There for you can direct the flow two different ways, and they can both be rotated 360 degrees to whatever direction you would like. - The Fluval FX6 high performance canister filter has a Purge Valve on the bottom, so that if there is any debris stuck at the bottom of the canister, you can drain it out. - There is a chip installed with the The Fluval FX6 pump so that every 24 hours, the filter shuts off for about 2 minutes, and lets all of the gases that have collected, rise to the top, and then when it turns back on, all of the gases are able to escape. 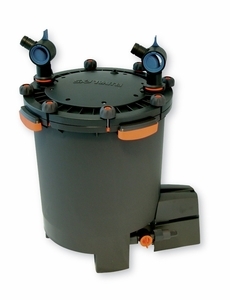 These Brand New Fluval FX6 canister filters come with a 3-year manufacturer's warranty. These FX6 filters are BRAND NEW in the BOX, shipped directly to us from the manufacturer. AquaClear Filters by Hagen ALL on SALE! !